For the second time in as many weeks, a U.S. airport has banned America’s largest chicken chain Chick-fil-A from joining its lineup of restaurants. On the heels of the vote of the San Antonio City Council to reverse a decision to include Chick-fil-A in a new airport terminal, Buffalo Niagara International Airport is now following suit. Plans were initially underway to include Chick-fil-A in updated food options in the Buffalo Niagara International airport. WKBW Buffalo reports that Buffalo Assemblyman Sean Ryan protested, demanding that the Niagara Frontier Transportation Authority and Delaware North reconsider the decision. Now NFTA and Delaware North announce that Chick-fil-A will no longer be included in the Buffalo Niagara International Airport. NFTA said in a statement, “We are working with Delaware North to move forward on identifying and offering best in class food selections for the thousands of customers who come in and out of our airport.” Chick-fil-A’s replacement has not been announced yet. 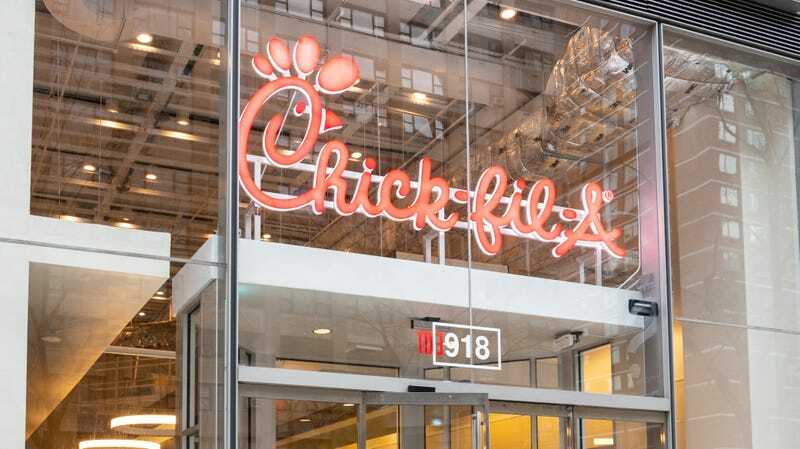 Recent coverage about Chick-fil-A continues to drive an inaccurate narrative about our brand. We do not have a political or social agenda or discriminate against any group. More than 145,000 people from different backgrounds and beliefs represent the Chick-fil-A brand. We embrace all people, regardless of religion, race, gender, ethnicity, sexual orientation or gender identity.